Get your replacement of hazardous aluminum wiring done by our professionals. If your home or business was constructed prior to 1980, chances are you have a fire hazard lurking inside your walls. Older buildings were wired using aluminum wiring, which is known to be a severe safety hazard. While aluminum itself is a quality metal, it should not be used at connection points due to fire and electrical shock hazard. Being a lighter metal, aluminum has the tendency to stretch, causing fasteners at the connection points to overheat. Our professional team will inspect your wiring and provide a free estimate on switching to safer copper wiring. How can you tell if you have aluminum wiring? Common symptoms include electrical outlets or face plates that feel warm or hot to the touch, especially after use. You may also have signs of a burning odor that can smell like ozone, chemicals, or plastic. Flickering lights is also a telltale sign of a bad connection. If you are unsure, an inspection is warranted and this is best left to a professional. As a highly experienced, fully licensed and insured electrical contractor, Custom Electrical Solutions is ready to inspect and repair your dangerous wiring. 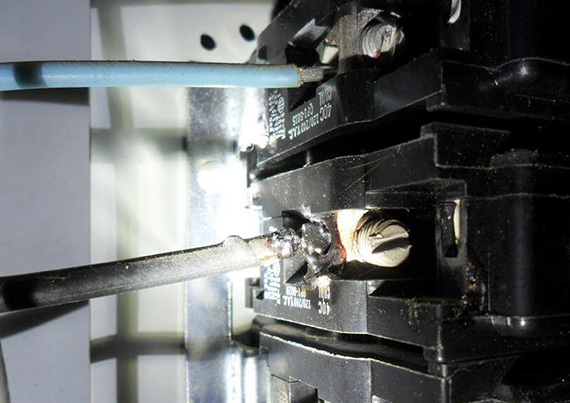 Replacement of hazardous aluminum wiring is vital in preventing fires, shocks, and injuries. If you own a home or business anywhere in Miami-Dade, Broward, or Palm Beach County, please reach out to our team today to have your wiring inspected and repaired professionally.